Goodwin Elementary School Visits Hispanic Studies! 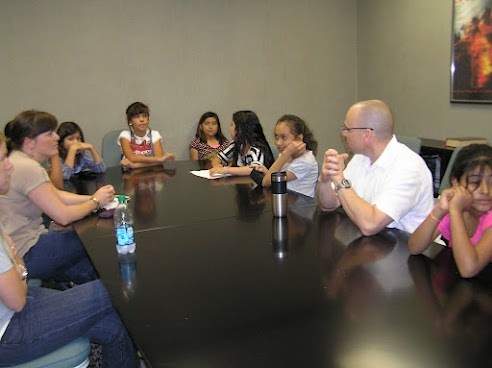 On May 23, 2012, eight Hispanic 4th grade girls from Goodwin Elementary School visited the Department of Hispanic Studies to learn more about college and career opportunities. In the Odyssey the Greek hero Nestor returned safely to Pylos. Today Mycenean Pylos is an important archaeological site located on the western coast of the Peloponnese in Greece. Carl Blegen first excavated the site in 1952 and identified the palace found there as the Palace of Nestor. Work on the Linear B tablets from Pylos is on-going. Dr. Kevin Pluta and Dimitri Nakassis have been selected to direct the publication of the Linear B tablets from Pylos. This will involve the production of three-dimensional images of the tablets, using multiple 3d imaging techniques. These images, along with a revised and re-edited commentary, will be published as Palace of Nestor IV. Monica Hoyle (AB 2012) will begin graduate school next fall at Western Michigan University in the area of Medieval Studies. Congratulations to Monica. Caitlin Carlisle (AB 2012) will be attending law school at Wake Forest University next fall with a merit scholarship. Congratulations to Caitlin. This year Classics recognized three of its students with named awards and honors: Mitch Cordes, Dan Egli, and Rachel Barkley. The Harold A. Mouzon Scholarship in Classical Studies is the highest distinction that a Classics major can achieve. This year the Department recognized Mitch Cordes as the recipient of the Award. As an AB Classics major, Mitch completed coursework in Latin and Greek (at the advanced level) as well as ancient culture courses. He also graduated with a BS degree in Biochemistry. Following graduation Mitch will be commissioned in the U.S. Navy and will begin medical school at the Uniformed Services University in Maryland. The Robert H. Duryea Jr. Memorial Scholarship is given to the Classics major, who demonstrates the highest performance in the Latin language. This year’s recipient was Dan Egli. Dan completed a major in Classics and an additional minor in Latin. He excelled in such courses as Ovid, Medieval Latin, Roman Biography, and Latin prose composition. Dan plans to teach Latin at the high school level. The Department’s Outstanding Student Award for 2012 went to Rachel Barkley. Rachel Barkley graduated from the Honors College with majors in both Classics and Historic Preservation, and a minor in Creative Writing. Rachel excelled not only in her outstanding performance in both Latin language and Classical civilization courses, but also in her ability to make connections and see the relationships between all of the subjects that she studied. In the near future Rachel plans to attend graduate school in Museum Studies. The NEH has awarded Dr. Zeiner-Carmichael a grant to participate in the Summer Seminar Communication, Empire, and the City of Rome at the American Academy in Rome, Italy, from June 25 to July 27, 2012. She will spend this research time in Rome and at the American Academy’s library to explore both the logistics of letter-writing in the ancient world and the role of epistolary texts as literary works, including their role in forming social networks. 1) “Introduction to Women of the Iberian Atlantic: Gendered Dimensions of Empire.” Sarah E. Owens and Jane E. Mangan. 2) “Cloistered Women in Health Care: The Convent of Jesús, María, Mexico City.” Nuria Salazar Simarro and Sarah E. Owens. Joseph Weyers’ article “Voseo in Montevideo’s advertising: Reflecting linguistic norms” has been accepted for publication in Studies in Hispanic and Lusophone Linguistics. 2012 Issue of HispanNews Now Available! Thanks to the efforts of Professors Ben Fraser (Editor), Nadia Avendaño and Claudia Moran (Associate Editors), the 2012 issue of HispaNews, the official annual newsletter of the Department of Hispanic Studies, is now available online: click here. 2012 Commencement for Bachelor of Arts and Bachelor of Science degree candidates for the School of the Arts, School of Humanities and Social Sciences and the School of Languages, Cultures and World Affairs. Degree candidate should assemble in Maybank Hall by 2:30 p.m. Gates to the Cistern Yard and the satellite viewing areas will open at 2:30 p.m.